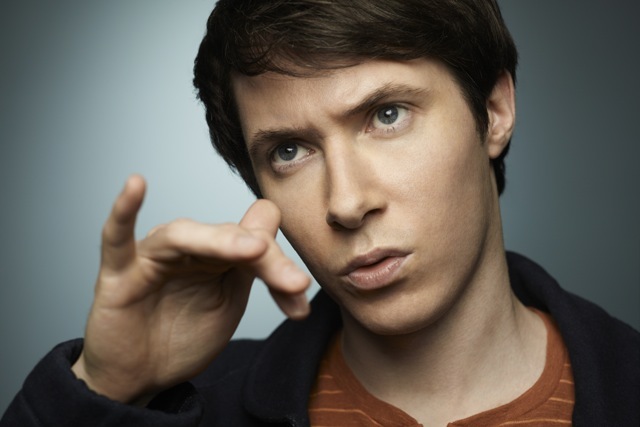 Stimeyland: My Interview with Ryan Cartwright of "Alphas"
My Interview with Ryan Cartwright of "Alphas"
Ryan Cartwright as Gary Bell of "Alphas"
I am always interested to see how television shows use autistic characters. Thanks to a column I wrote for Autism Unexpected, I was able to conduct an email interview with Ryan Cartwright, the actor who plays autistic character Gary Bell on Syfy's new show "Alphas." Ryan had some great answers to the questions I had about creating an autistic character for television. He was interested in seeing his full answers published, and I agreed. You can check out his work on "Alphas" on the Syfy network every Monday at 8 p.m. Don't forget to read my full story about the show as well: "He's not autistic, but he plays one on TV." Check out what Ryan had to say, and be sure to let me know if you've watched "Alphas" and, if you have, what you think of it and its portrayal of autism. Jean: How did you approach playing an autistic character differently than the other roles you've had in the past? RC: I used the same approach—it was just the amount and specificity of the research that differed. I always need to feel as though I have earned a right to play the character, to the point where the character is actually playing me in a sense. I wanted to do as much research as possible to the point where I felt as though I could empathize with Gary as though he were a real person and not a fictional character. What did you do to prepare to play Gary? I watched a lot of documentaries, YouTube videos. Consulted with people who work with autistic people. The most helpful and interesting aspect was the literature I found. Some wonderful books by Temple Grandin, Daniel Tammet, Oliver Sacks et al; and some lovely vlogs and blog sites by autistic people. Specifically, reading about autism and neuroscience helped me understand the reasoning behind a lot of the physical attributes and difficulties of people with autism, which in turn helped me create, as opposed to imitate, a physicality for Gary. Also, I must mention that Gary’s autism isn’t necessarily linked to his ability to visualize electromagnetic waves, and that the process of maturing while being bombarded with this perma-light show inside his brain has also affected how he behaves as an individual. Do you have any personal connections to autism in your life? A good friend of mine is autistic and he gave me some nice little insights into his disorder, but that wasn’t something I drew from a great deal. What was the greatest challenge you faced in preparing to play Gary? The main challenge was correlating all the disparate bits of info I had for the character and then making him his own person with a decent amount of consistency. To be brief, the character was a rough sketch to begin with, and the wonderful writers and producers on the show, along with myself, slowly connected all of Gary’s traits and conditions until he was a balanced and believable individual (considering his circumstances). A fun bit for me was creating all of his hand movements for how he guides himself through the wavelengths. What are your favorite things about Gary? I like that he has a voice, an attitude and a developing sense of humor. He’s an innocent in certain ways, which makes him endearing, but he’s also finding himself in a position of great appreciation and admiration for the first time in his life, so he’s strutting a little. It’s also quite relaxing to not have to look people in the eye all day. You end up listening and visualizing a great deal more, which puts me in a different head space altogether, and we all know that’s never a bad thing from time to time. Do you and Gary have any similarities? What can fans look forward to in terms of Gary this season? What, if any, responsibility do you feel to the autism community to portray Gary realistically? Obviously that was the reason I did so much research in the first place. As an actor and an empathetic person, I wanted to know that I was coming from a real place. I’ve been very touched by all the people who have expressed their appreciation of my portrayal thus far. I feel as though my first responsibility is to Gary as an individual. As I’ve said before, you want to play the person NOT the disorder. Everyone involved in the show is taking great pains to be sensitive to the autistic community, none more so than myself. At a certain point you have to let the character do their own thing, and I believe the worst thing you can do when portraying someone with a different lifestyle or manner of perceiving the world is to patronize by way of condescending with compassion. People who have faced great difficulties rarely want pity, and often find it offensive and misplaced. It’s not just autistic people who live on a spectrum, we all do. Everybody has an individual voice, and Gary is just expressing himself how he feels most comfortable. What is your favorite thing about "Alphas"? Nice location shooting. The stellar cast. Phenomenally talented and responsive writers. Super smart producers. The humorous character banter. Catering, and days off in Toronto. Big up! Is there anything else you would like to let me know about your experience playing Gary? My readers tend to be parents of children with autism or autistic people themselves. Is there anything you would like them to know? I just hope that they enjoy seeing Gary blossoming against his own adversity. I’m an entertainer, and that’s mainly what I hope Gary and the show as a whole does for everyone regardless of their life situation. We all deserve a little entertainment on Spaceship Earth, right?! As soon as I started watching this show I thought "Ryan Cartwright has put a LOT of work into this charcter". I feel like he isn't an amalgamation of symptoms or a sterotype. he really IS an individual with autism. And yes, his relationship with Bill has been my FAVORITE! Thanks for this interview! School Went GREA— Oh. Never Mind. Is the School Bus Here Yet?